I've been baking for a while now and quite happy with the way my bakes come out of the oven.For a long time I believed (or made myself believe! 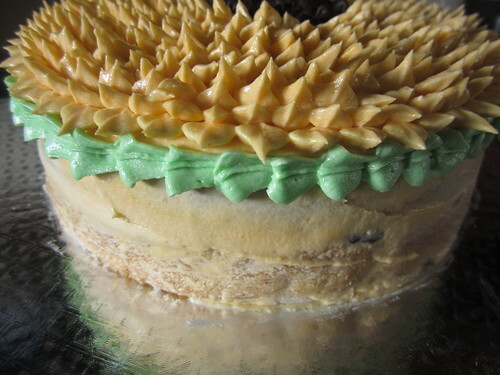 )that taste is what matters,not the looks.As long as the cake/cupcake or any other bake tasted amazing,it didn't matter one bit if it was decorated or left plain.After all,frosting simply meant extra sugar and we could do very well without that right? All this changed for me when I got a few birthday cake orders from my friends for their kids.They didn't want a fancy cake alright but when I was asked to bake for someone else,I wasn't too happy with the product I was giving them.That too for their birthdays!I decided that I have to learn cake decorating,at least for times when I was baking for others. 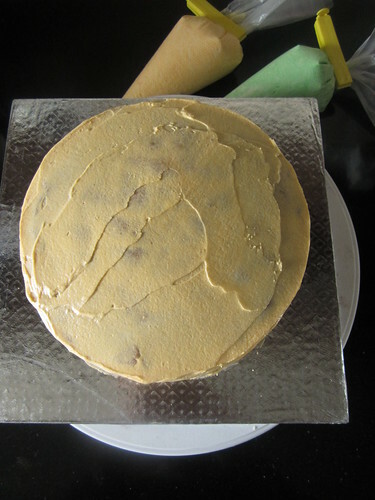 Bake and cool your cake completely.If possible cover in cling wrap and refrigerate overnight.Chilled cakes are easier to torte and crumb coat. 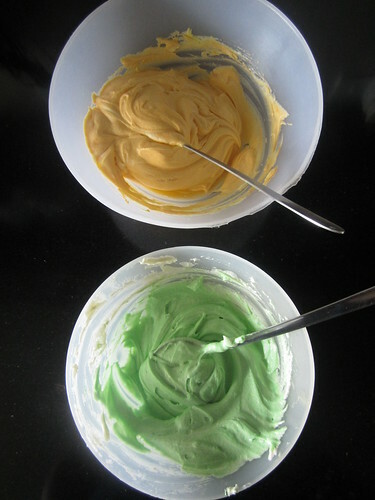 Divide the buttercream into two parts(I always keep about 1/3 cup icing aside before coloring just to be safe).Colour one part yellow and one part green. 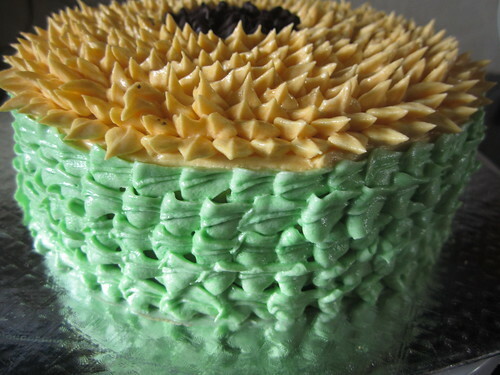 To colour the icing-dip a toothpick into your desired colour and swirl into the icing.Use a new toothpick for colouring it second time-do not use the same toothpick-blend well using a spatula and keep adding colour till you get the desired shade. 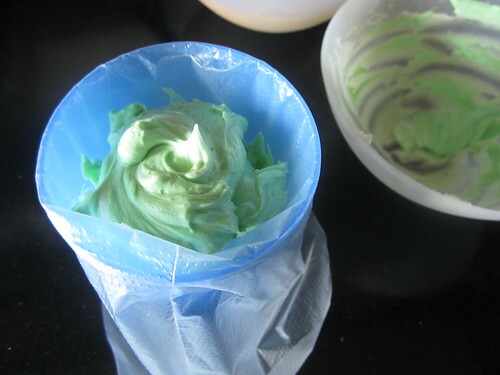 Place the two leaf nozzles in two disposable icing bags by snipping the end of the bag and placing the nozzle in it.I use the glass method to fill my icing bag. 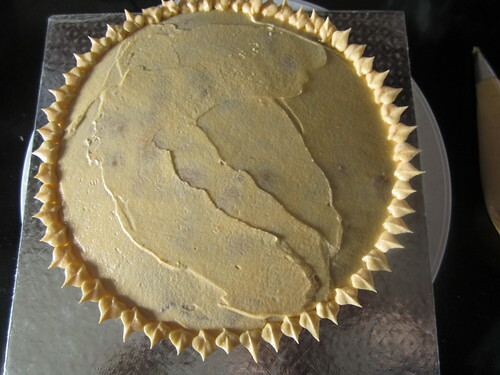 Use a big plastic glass and place your icing bag in it.Fill about little more than half of the bag with buttercream.Twist the bag closed and remove air bubbles if any by squeezing some of the icing by the tip into the bowl. 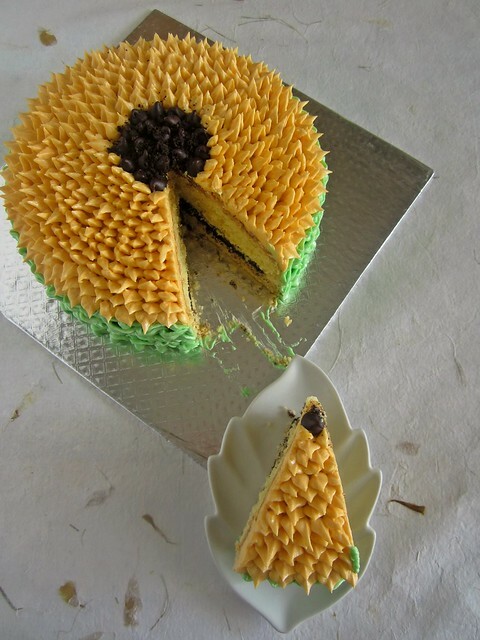 You can leave the cake plain(without filling)or torte the cake into two even pieces horizontally.Sandwich the cake with ganache and do a simple crumb coat. 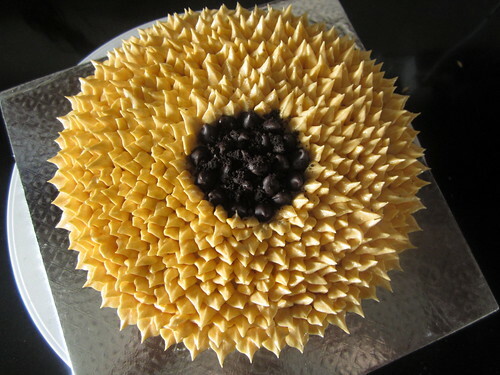 Start from the outside of the cake-Hold the bag at a 45D angle with the point of the triangle of the tip facing upwards and squeeze out one petal.Make sure the tip of the petal stands upright. Pipe another one close to it and follow this method till you finish one full round. 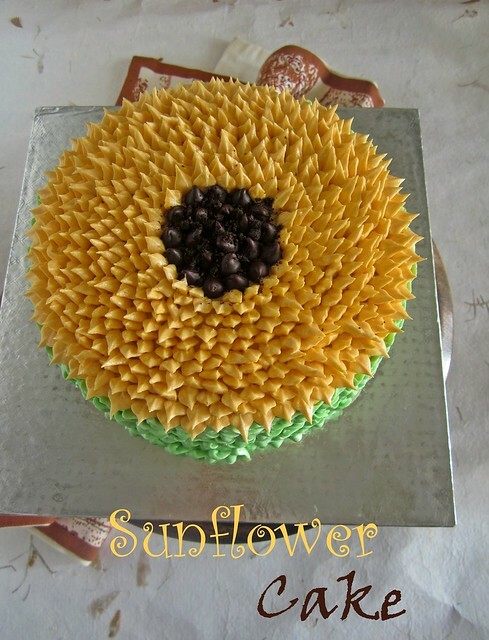 Start piping petals inside and keep filling the whole cake with this method. 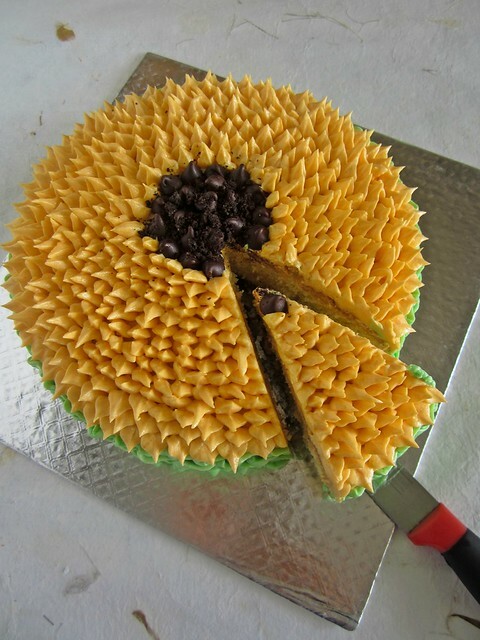 When you are about 3/4 done,mark a small round in the middle of the cake,using a bottle cap or a cookie cutter.Fill the round with chocolate chips and some Oreo crumbs. 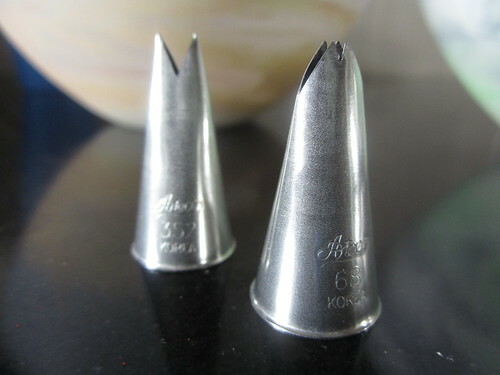 Continue piping round the center till you are done. 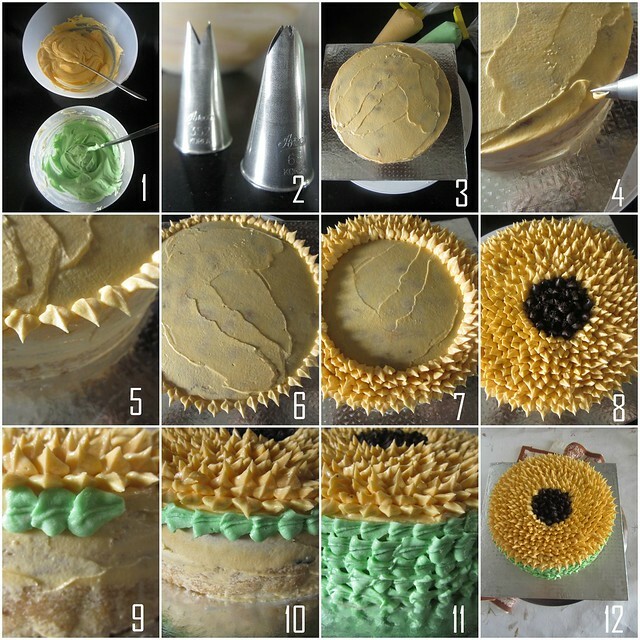 Hold the green coloured piping bag and do a shell-motion by piping one leaf and starting the next one at the tip of the first leaf. 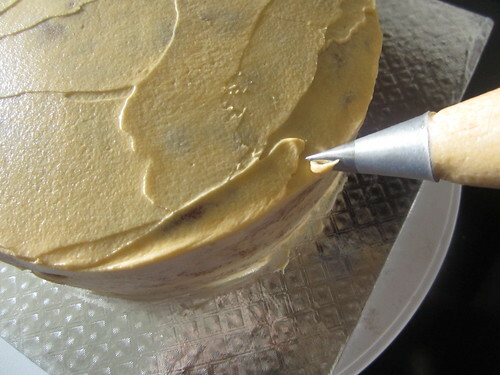 Finish the sides of the cake by piping this way. 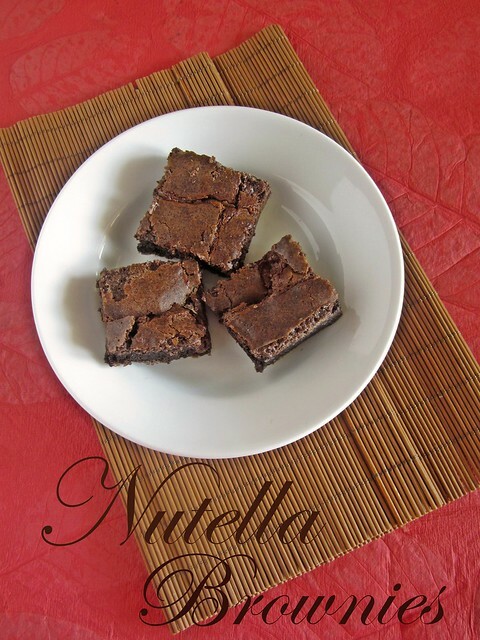 Yesterday was World Nutella day and I had planned to post this to combine my friends' birthday as well as WND.Things got busy and the post got delayed.But better late than never eh?Well,no time is a bad time to post something as delicious,gooey and fudgy as these brownies,I mean do you really need an excuse to whip these up? 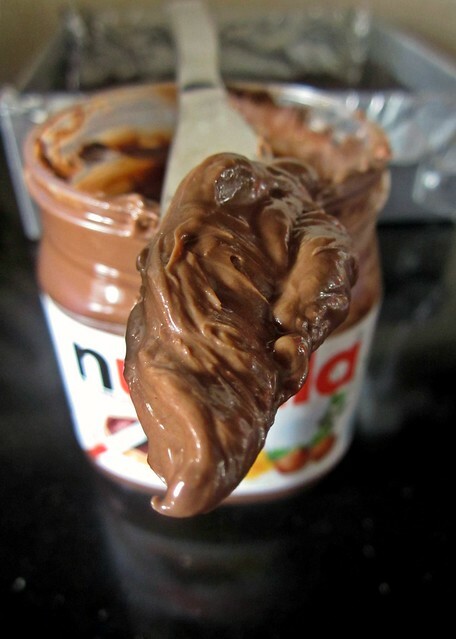 I am not one of those people to enjoy Nutella straight from the jar(Yes I know! )but I love to mix it up in my baked goodies.This cake of course tops the list and these rolls come second.Combining it in a brownie would just make it to the top of my list and it did.Gooey brownies with a swirl of Nutella can never go wrong.These do not score well in the looks department but taste awesome.I contemplated a while before posting these as I wasn't very happy with the pictures,but a good recipe has to be shared,right;)? Only change I would suggest is to use fine granular sugar.The recipe says it's ok if the batter is a bit granular but I felt some of the sugar crystals didn't melt evenly and it was a task getting these buggers out of the pan even though I lined the pan with foil.Maybe one single pulse in your mixer would break the sugar crystals a little,which would work out perfect while mixing. Preheat oven to 170C.Grease and line a 9 by 9 inch square pan with parchment paper or aluminum foil. 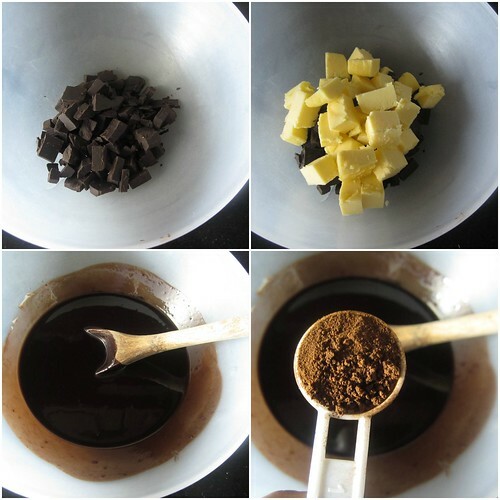 Microwave chocolate and butter in a big bowl for 1 minute on high.The butter would melt completely and the chocolate would still hold its shape.Stir well using a wooden spoon and the chocolate would also melt in the heat.Stir in the coffee powder. 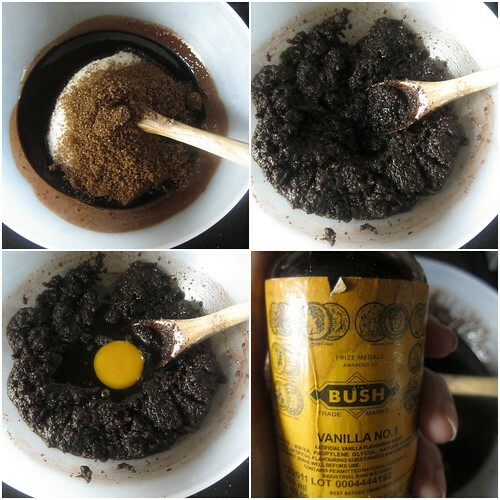 Stir in both sugars,mix well.Add eggs one by one and then the vanilla. The batter would be a but granular but it's okay.Stir in the flour.Mix only till combined and no specks of flour remain.Pour into the prepared pan. 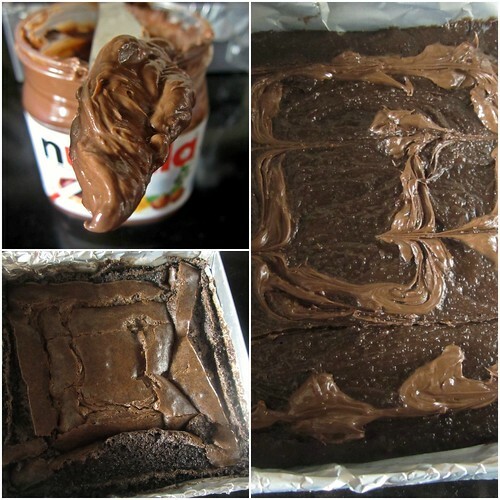 Add Nutella to the top of the mixture and either leave it as it is or do a zig zag pattern on top. 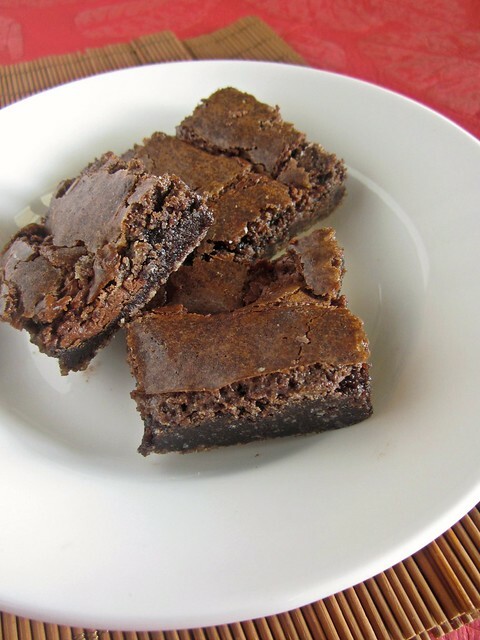 Bake for 25-28 minutes or until edges pull away from the pan and the top and center is just set.Keep these gooey and do not overbake,these will firm up as they cool. Before I ventured into a cake decorating craze,I knew of only a few frostings.I kept going back to the basic ABC aka American Buttercream or a simple chocolate ganache.Though I liked the ease at which ABC could be made and the consistency as well,I was not entirely happy with the texture.Despite using fine icing sugar,sifting it a couple of times,I could taste the grainy feeling in my mouth after having a slice of cake. My frosting 'guru',as I'd like to call her,directed me to this recipe by Veena's Art of Cakes.It is called a 'whipped buttercream' and uses a unique method of beating together icing sugar and cream and then adding butter at the final stage.I was intrigued at this amazing method and decided to try it out.However,the original recipe uses meringue powder as an added ingredient. 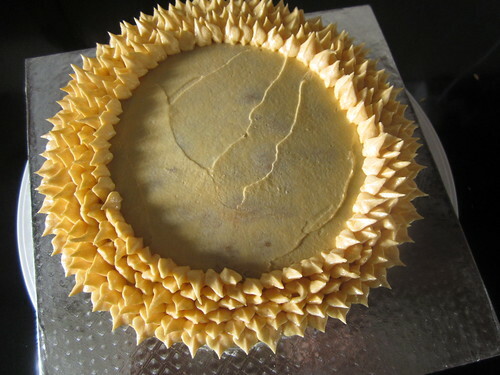 I have used this buttercream for frosting as well as filling.Though I'd suggest a different filling for a contrast in taste,however it is up to you.This recipe makes enough to frost an 8' round cake but that too depends on what decorating tip you are using.Rosette tip needs double as much whereas a star nozzle might require less. In the bowl of your electrical mixer,add approximately 1/3 of the icing sugar,salt and meringue powder(if you are using).Stir to combine. 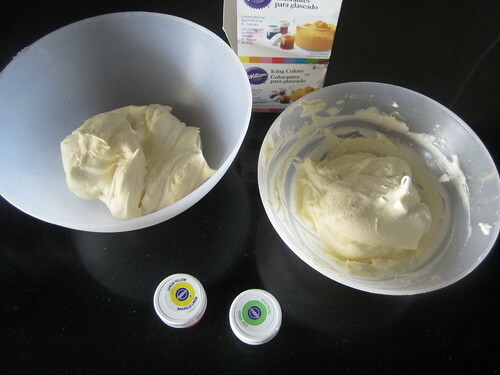 Now switch the mixer on low and slowly add in 1/2 of the cream.Let the mixer run on medium for about 5 minutes.The mixture will become light and sticky giving your buttercream a velvety texture later.Don't make haste with this step.Let it cream well. 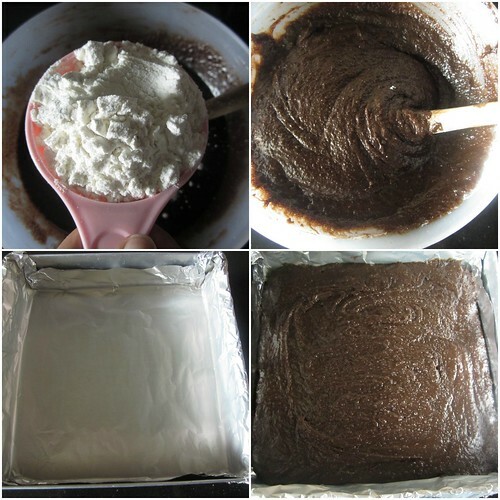 After 5 minutes start adding the rest of the sugar slowly.Continue to mix on medium.If the mixture appears too dry add a tbsp or two more cream.Be careful with the quantity,add cream only if the mix appears too dry.I stop when no flecks of sugar remain.Even if the mix is lumpy,it's fine. 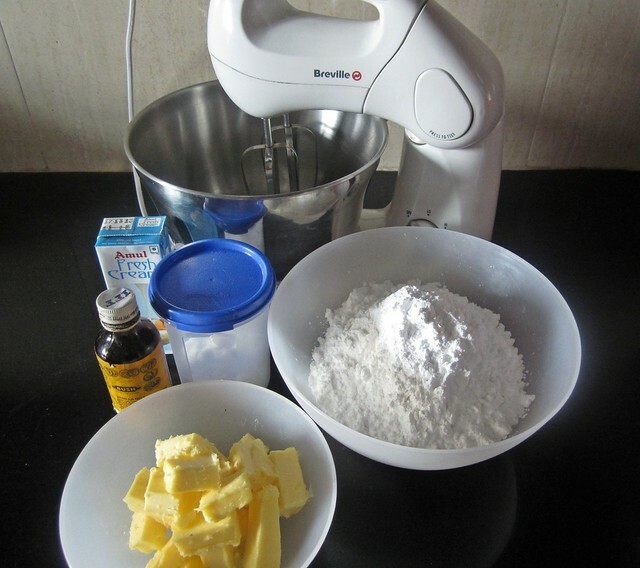 After about 3 minutes,start adding the butter into small batches making sure it is well incorporated.Add the vanilla. 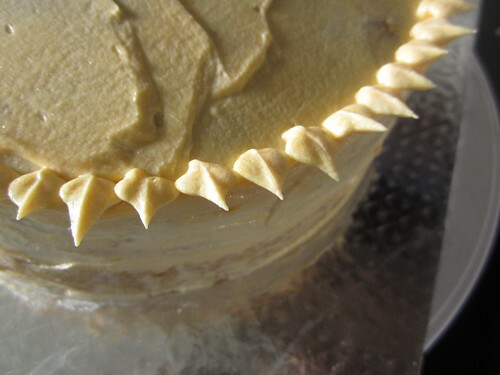 Once all the butter is in run the mixer on high for about 3-5 minutes or more until you have a creamy velvety texture and the buttercream does not taste grainy. 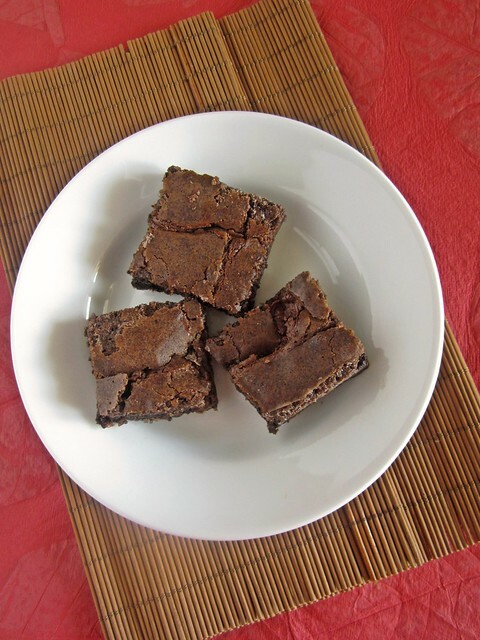 When you taste it,you should have a smooth velvety texture in your mouth with no trace of any sugar grain. 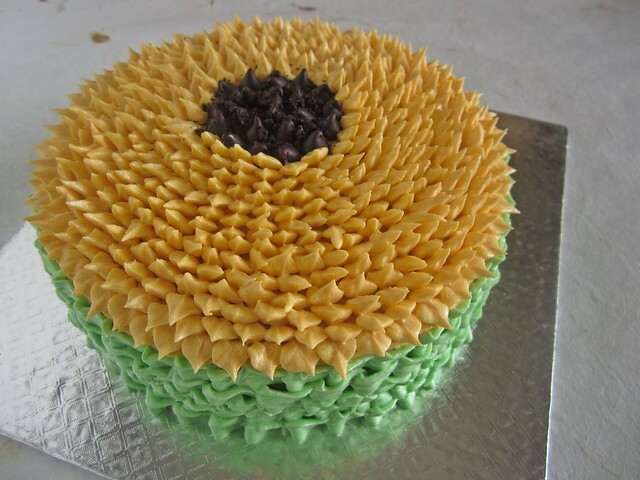 Variations - You can flavor the buttercream with your choice of extracts.Strawberry,Almond,Pineapple and so on.For a chocolate version,add cocoa powder along with the icing sugar.A couple of spoons of Nutella would taste great as well. 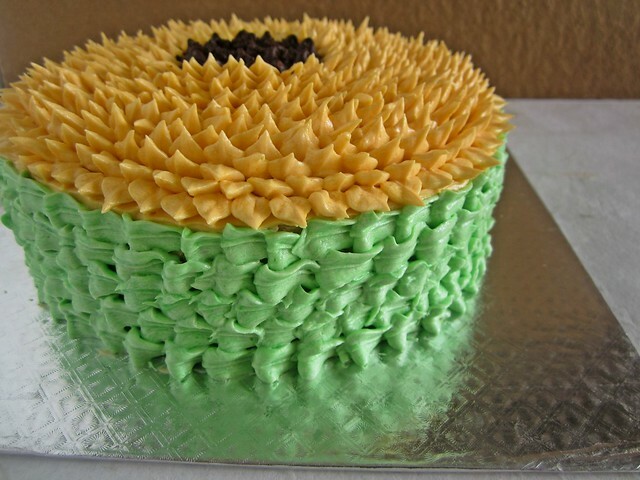 Here's a cake I decorated using whipped buttercream.I used two different leaf tips for the top as well as the sides.I posted a query on the facebook page regarding a step by step for this one and thanks to all of you for the tremendous response.I will be putting up the tutorial shortly.